In this Oracle SQL training course, expert author Steve Perry teaches you everything you need to know about this graphical user interface. This course is designed for the absolute beginner, meaning no prior knowledge of Oracle SQL is required. You will start by learning about a basic SQL select statement, including how to retrieve data from a table, use mathematical and text expressions, and sort the results using column names. Steve will then show you how to restrict data, join tables, and summarize data. This video tutorial will also cover data subsets, restricting data, using subqueries, and data modeling. Other topics that are covered include creating tables and manipulating data, single-row functions, creating and using views, database management, and legacy SQL techniques. Once you have completed this computer based training course, you will be able to use Oracle SQL as your main productivity tool for development. Working files are included, allowing you to follow along with the author throughout the lessons. 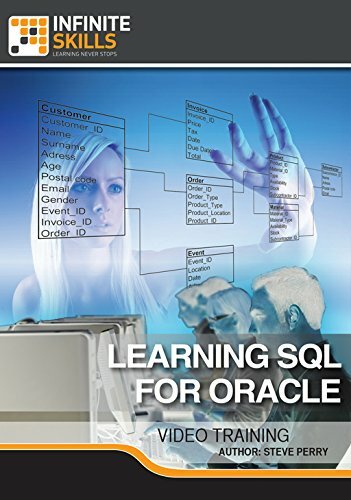 Learn SQL For Oracle from a professional trainer on your own time at your own desk. Comes with Extensive Working Files. View More In Sound Libraries. If you have any questions about this product by Infiniteskills, contact us by completing and submitting the form below. If you are looking for a specif part number, please include it with your message. © 2019 - rightclearing.com. All Rights Reserved.